Diabetes could become the primary cause of death in Mexico in the next few years if we don’t take urgent steps to prevent that from happening. One of the main causes of the disease is a poor dietary culture. What a 100% increase in the next 20 years means it has been proven that this increase is related to an abuse of refined grains and sodas. The current model of eating induces us to eat cookies, cakes, granola bars and crackers. Nobody has told us that to be healthy we should increase our consumption of grains and decrease our consumption of fats, however, with this type of diet we are taken to extremes and abuse carbohydrates, provoking an increase in overweight people, obesity and diabetes. Ten years ago diabetes was the fifth leading cause of death; now it is third and within a few years it could be the leading cause of death. The economic cost of this disease is about 6 billion pesos or $600,000 USD annually. When we eat bread and cookies or drink sodas we drastically elevated our blood sugar levels. To visualize this effect, we can compare carbohydrates to a train with various wagons of sugar, the drop-off its contents in the blood stream. When we eat bread the sugars from it reach our blood stream, dramatically elevating the blood glucose levels. The brain takes sugar as it needs it to function, but when it detects that there is still more sugar in the blood, it sends a signal to the pancreas and that organ secrets a hormone call insulin, which allows the sugar to pass to the liver and muscle. Once these organs have filled their reserves, the remaining sugar is stored as fat in our adipose tissue. As we increase our consumption of carbohydrates, we also increase the production of insulin. With time, the cells in our body that don’t need any more sugar to function become resistant to the action of the insulin, which makes the pancreas produce more insulin to force the cells to permit sugars to pass, leading to a condition called hyperinsulinism. Over time, the pancreas wears out and stops producing insulin or produces an insufficient amount, which results in adult on-set diabetes. The detection of diabetes is simple; however, one in two people suffer without knowing that they have the disease or how to control it. It is important to have a basic understanding of the disease, which will help us recognize it. With the proper control, someone with diabetes can still lead a normal life. A person may detect the disease when he/she has to urinate more frequently than before, if he/she has to get out of bed at night to use the restroom and drink water. Generally, people who suffer from diabetes are thirstier than normal. Or, they could feel weak and not have enough energy to do their job or household work. Others have blurred or double vision. These symptoms are generally present with more advanced age. Some people complain of dry and itchy skin, while others feel numbness in their hands and feet. The disease may also manifest itself with sexual problems, such as decreased sexual desire or impotence. In many patients, the presence of sugar in urine is the first sign to go to the doctor and think about diabetes. Although some patients don’t have sugar in urine until the blood sugar reaches higher levels, 170-180 mg/dl. The sugar level is not always an exact measurement of the amount in the blood glucose. Some people complain of being more susceptible to infections than usual, particularly urinary tract, due to the presence of sugar in urine. The body makes little or no insulin, so the patient needs insulin injections to be able to live. This type of diabetes is present in about 10% of diabetics and is generally present from birth or caused by an illness during childhood. In this type of diabetes the body makes insulin, but it cannot be used adequately. Around 90% of diabetics have this type of diabetes. 1. Overweight people: Generally, being overweight in the abdominal region is associated with diabetes. An overweight person whose blood sugar level is between 125 and 140 mg/dl is considered diabetic, but if he/she loses weight, even as little as 5-10 pounds, his/her blood sugar level could return to normal. 2. People with diabetic or hypoglycemic relatives. 3. Patients that have had diabetes during pregnancy or that have given birth to a baby that weighs more than 8.5 pounds. 4. People of African American, Hispanic or Native American origin. Sometimes the only thing that is needs to normalize blood sugar levels is a change in the schedule and amount of food in each meal. It is recommended to eat 3 meals a day and 2 snacks. This change distributes the absorption of sugars in the intestine and maintains glucose levels closer to normal. The goal is to normalize the amount blood glucose levels over each 24 hours. For snacks, pick fruits, such as an apple or a cup of melon. Avoid consuming cookies or bread, as they abruptly elevate blood sugar levels. 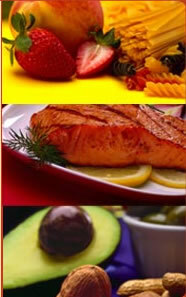 • Reduce the amount of fat in your diet. Diabetes sufferers should avoid consuming saturated fats, which can provoke triglyceride accumulation in the arteries and arterial hypertension. • Avoid cured meats, sausage, bacon, margarine and shortening, chocolate and French fries. • Reduce the quantity of food with a high glycemic index, which rapidly elevates the amount of sugar in cells. Some examples include: boxed cereals, sweets and sodas, which all provide little nutritional value and lots of calories. • Combine foods. When we consume bread or a cracker the sugars reach our blood quickly, abruptly elevating blood sugar levels. To reduce the speed of absorption of the sugars you can combine the bread or crackers with protein. For example, eat bread with ham or cheese and crackers with tuna. Fats also exert a protective effect on stomach emptying. You can eat bread with avocado or eat crackers with peanut butter or some almonds. • Increase your consumption of fruits and vegetables. Fruits and vegetables contain high amounts of vitamins and minerals and are important sources of fiber. Fiber slows the speed of sugars reaching blood, stabilizing the blood sugar levels. • Consume foods rich in fiber. Whole grains provide fiber and essential nutrients for diabetics. It is recommended to consume oats, wheat or brown rice, or products made with whole, such as seven-grain or pumpernickel bread.